Let’s face it: a move is a major life event, and it can be stressful. That’s why every bit of prep work counts in reducing last-minute pressure. Think of each completed task as one step towards a smoother transition. A little work ahead of time = a little less work later. 2. The SELL pile–Hold a garage sale: Take everything you put into your sell pile and give every item a price tag. Hold a garage sale and pocket the proceeds-think of it as a moving fund that will help with supplies and miscellaneous needs. 3. The DONATE pile–Give to a good charity: Anything you don’t sell, add to your donate pile and give it to charity. 4. The KEEP pile-Prepare to pack: This is what you’re bringing with you to your new home. Examine everything and get a good feel for just how much you need to transport. 5. Plan your strategy: Start thinking now about your moving method. 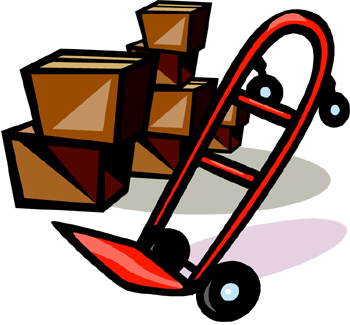 Will you hire a mover? Compare prices. Are you asking friends to help? Set up a date now. Will you rent a truck and do everything yourself? Book the rental and begin planning. 6. Gather supplies: Be ready to pack with all of these necessities. You’ll need plenty of sturdy boxes in various sizes, packing tape, scissors, bubble wrap and markers for labeling. You may decide to purchases specialty items from moving companies; however, a little research and hunting around could save you money. Look around online, ask friends and put the word out that you’re planning to move soon. 7. Put your paperwork in order: Let important people and businesses know about your upcoming change. Consider contacting banks, schools, employers, medical offices, and so on. Alerting them to the new address will be one less thing to do later. You might also want to get “Change of Address” cards. Fill them out now, so you can just drop them in the mail closer to your move date. Editor’s Note: This post is part of a series on packing. View the next article, “4 Steps to Start Packing,” here. » The selling process went well!